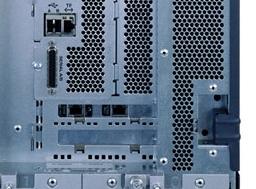 Hey, the V890 is just the bigger brother of the V880 which always had a DB25 serial connection. Nowadays the RSC/ALOM is preconfigured so use the RJ45-serial of the ALOM to manage the server. Unfortunately the RSC/ALOM cannot be used during installation. Before you can use it, you'll need to install additional software, namely SUNWrsc. Couldn't you just buy a RJ45 - DB25 shell and wire the pinout so it will be compatible? yeah, you are right. It is the old rsc-card. As from the new servers they have ALOM/ILOM or SC connection with installing additional software for it. Now you know, when you are going to fiddle on a V880/890/480/490 you need your toolbox with you. Or put in the cyclades DB25 connector delivered with the console server for initial configuration.